I've had a rather busy but very lovely week so far which I've spent with all my favourite people. Not even the hangover from hell yesterday could put me in a bad mood. 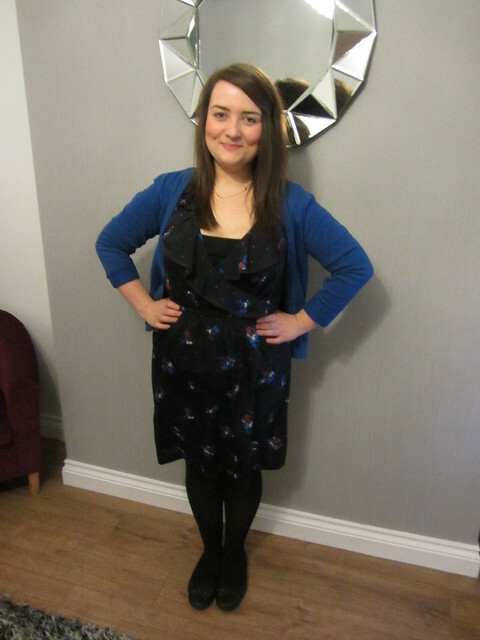 This is what I wore to work on Tuesday, I forgot all about this dress and it felt quite girly and Spring like. It also makes a nice change for me not to be wearing all black. I had pancakes at my friends house on Tuesday which meant that I didn't have to make them, my batter is always lumpy and my pancakes stick to the pan so I was happy to leave flipping duty to Harri. I ate a few too many covered in nutella but I only have them once a year so it seemed a shame not to over indulge. I've been wearing my new Daisy non stop since it arrived, its so dainty and I'm going to get a few more and stack them up. I used WELCOME10 to get a 10% discount on my 'G' ring. Wednesday was also another food filled day, I took my friend Louise to Juno Lounge on Wellfield Road in Cardiff for lunch and we both had very tasty burgers. I had chicken but was a little jealous when the salmon and crayfish one came out for Louise, it looked amazing. We hit all the charity shops for a good rummage on Albany Road (my favourite place to bargain hunt). 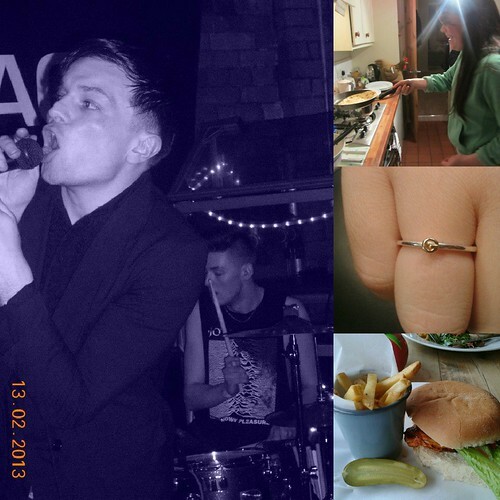 Food and shopping are probably the best combination ever.We headed to Clwb Ifor Bach in the evening to see The Chapman Family, an amazing band from the North East (obviously, its where all the best bands are from) and they blew me away. You can download their new single for free here. It definitely felt like they should be playing to a much bigger crowd and I hope I catch them again at some festivals this summer. Bit of a busy weekend to look forward to now, off to a Welsh Labour conference tomorrow and then going to see the NME Tour on Sunday night, really excited about seeing Peace and Miles Kane! Aw, lovely, Gem! That dress looks great on you - super flattering and the print looks awesome! Sounds like a fun week! Miles Kane has been acers when I've seen him - enjoy that! Nutella was defs the one thing missing from my pancake fest. Mmm that burger looks delish. And you look lovely too! The Chapman Family are from my home town! I love that ring bb, I need an S in my life. Love the dress, the cardy is a beautiful colour!